You can climb aboard one of our large red sleighs for a ride to dinner; or if you can’t fit the dinner into your plans, cuddle in one of our charming one-horse sleighs or gather your group for a half hour scenic ride. 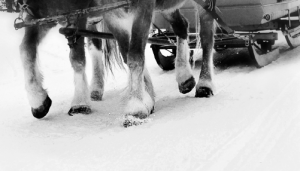 All of our sleighs are pulled by our well trained and beautiful draft horses. Your winter sleigh ride will take you through tall pines and over glistening snow. Climb aboard one of our large red sleighs for a ride to dinner. 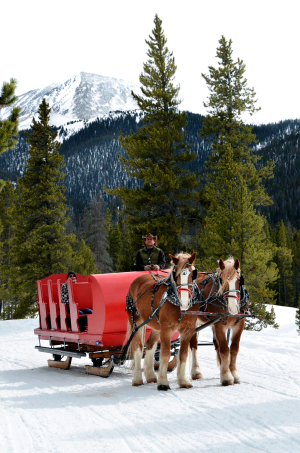 Or if dinner isn’t on the schedule, enjoy your winter sleigh ride in one of our charming one-horse sleighs for a romantic ride through the Colorado scenery. If you are in a group, come for our 1 hour scenic tour through the Colorado winter wonderland. 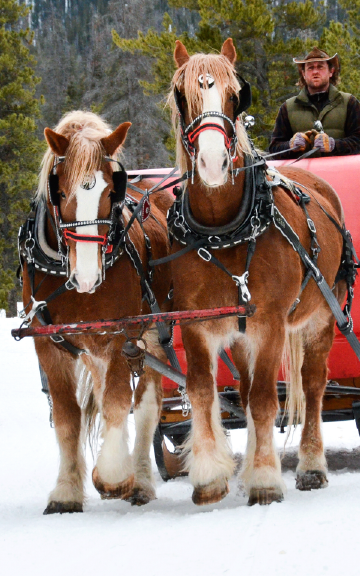 Whether you come on a beautiful Colorado afternoon, or under the stars on a crisp mountain evening, you will be glad you added Golden Horseshoe Sleigh Tours to your Summit County vacation.